Above, Book blurb. The Dragon-Masters by Jack Vance. What I intend to do with this 'Pulp Book Review' series is to share with you the half dozen cheap Sci-Fi books, which were gifted to me as an early teenager. The first post in this series can be found here. These are the books that I loved so much I re-read them at least once a year, sometimes more. These books I kept on my bookshelf as others made way for newer titles. You could say these books had a part in influencing my reading preferences. So, as a teenager I loved The Dragon-Masters and read it often. The story was first published in 1962, but my version of it was published in 1982 and soon after that it hit the bargain bin. I think it was given to me for Christmas around 1983. This story is a nice easy read and is complete in only 133 pages, I remember thinking at the time this was a nice length. Skip forward to the present day and after reading 800-1000 page mega novels like those of Peter F Hamilton's Commonwealth sagas, the story itself now feels more like an outline than a complete story. 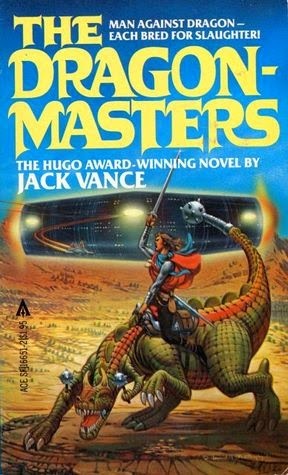 However short The Dragon-Masters is, Vance seems to have put a lot of thought into the back-story of the universe this novel is set in. It is quite complex and detailed. Not having read any other books of Vance’s I can't say if this was part of a collection of books set in a common universe similar to H Beam Pipers Space Viking and The Cosmic computer, but maybe it was meant to, who knows? Not I. After re-reading it recently I was struck with the weighty vocabulary that Vance wields. Even though I understood the meaning of most words when used in a sentence I did have to look up a few words to make sure I had understood them correctly. My favourite, the old seneschal named Rife, who spends most of his time sleeping, explains a job he was given as 'sinecure' work and was wondering if it was given to him because he is old and inept. I sometimes wish for a sinecure job, one where the profitability is largely monetary. One reviewer wondered, that seeing how adept Vance is with language, how he could end up with such an awkward and embarrassing title as Dragon-Masters, and mentioned that they would have avoided the book on the title alone, if they weren't already a fan of Vance. However I think this was one of the reasons I, as a boy of 13 was drawn to the book, that and the cover, a knight on a dragon fighting against a spaceship! That's what sells books! So basically a race of lizard-like aliens are hunting down the human remnants of a galaxy spanning war. This group of aliens are using selective breeding to alter the human race into various sub-species, Weaponeers, Trackers, Giants and Steeds. Similar to what we do with our domestic breeds today, one dog type but different breeds. In turn an ancient hero of Aerlith, Kergan Banbeck, was able to capture some of these lizard-like aliens during one of their raiding parties and has turned their basic stock into 'dragon' soldiers featuring Spiders (steeds), Fiends, Blue Horrors and Juggers. It was an interesting juxtaposition, humans riding around on Spiders was OK, but then having that turned around and seeing these lizards (basics) riding around on modified rabbit-like humans seemed a little grotesque. That was possibly Vance’s point though. We start with the dire predictions of the basic's return, a battle between two human factions which introduces us to the uses of these dragons in war. This battle is then interrupted by the actual return of the basics and a battle between the modified human forces of the basics, and the dragon forces of the humans ensues. In the end 'It would appear, that dragons armed with fangs, swords and steel balls (human forces) are more effective than men with guns and heat beams (basics forces) - at least in close quarters.' So in the end human armed with dragons trample dragons armed with humans. Confused yet? So who really did win? What to Make Of the Story? Well, I really don't know if there is any real underlying themes except that it is a good, well told story. The overt theme is one of selective-breeding or genetic manipulation both between humans and basics alike but there is another underlying theme and that is communication or lack thereof. Within the story there are several conversations between the humans and basics, and the humans and another 'race' of human, the Sacerdotes, who were on the planet before the 'recent' arrival of the human Dragon-Masters. In all these cross-species communications each side was able to speak to each other but the concepts behind the words was where the communications failed. In the conversations between the basics and the humans, the basics were unable to comprehend the concept that the humans who captured basics would want to negotiate the release of the human captives for the basics captives, it was inconceivable! The same with the Sacerdotes, their culture insisted that they speak the truth, but when speaking with normal humans they would answer in a way that understanding was all but impossible. On every occasion it seems that a lack of effective communication between each party, because of their underlying ideologies, was the cause of all the conflict within this story. Generally, conflict arises when people feel threatened and it’s harder to soothe and reassure people when they are frightened or angry. In this story the opposing parties tried to negotiate peace but because of their inability to understand each other’s ideology or cultural background, it ended in further conflict. A possible reflection on the cold-war of the 1960's? All up the story is a nice easy read and a pleasant way to spend a rainy afternoon. Here is a link to the Dragon-Masters reviews page on GoodReads where I quotes some of those reviewers. Follow me on Twitter or Google+ click on the images below.